Older Drivers - Older and wiser? Although access to public transport has improved in many urban areas, rural journeys, out of town shopping, and cut backs in other services can make some places virtually inaccessible to old people. This can be an inconvenience for people of any age, however, the need to drive in order to lead a 'normal', independent life is increasingly essential for many of our senior citizens. But what about the fitness of older drivers? 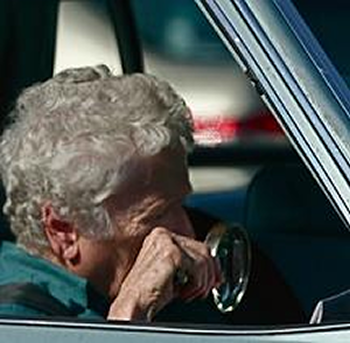 How fit for the road are elderly people and should they be allowed to drive at all? 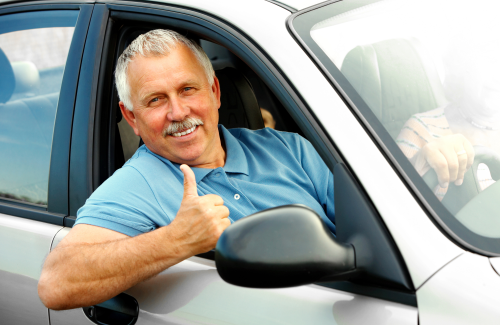 On this page I consider some common age related driving issues and offer a few solutions. For some older people, some journeys can be difficult, if not impossible, without a car. Whenever I discuss the current road and traffic situation with older drivers they are quick to point out that it is the younger drivers on our roads that cause all the problems. And indeed, statistics would seem to back this up. Drivers under twenty-five tend to have more accidents and pay higher insurance premiums. However, although drivers over seventy (as a demographic group) appear to have fewer accidents a there is some evidence to show that the accident rate increases dramatically amongst some drivers over seventy-five years of age and matches the level of younger drivers. Other studies suggest that mile-for-mile elderly drivers have more collisions than younger drivers – and furthermore, are more vulnerable when involved in an accident. 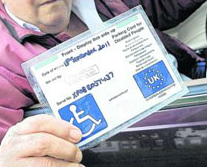 With the numbers of older drivers increasing by about 1.5% each year the problem is growing. Sheila Thomson, who has been driving for 70 years, makes the 15-mile round trip in her Peugeot 106 from her home in Broughty Ferry, near Dundee, to church in Invergowrie every Sunday - she is believed to be the oldest driver ins Scotland. As well as making the weekly journey from her home to Invergowrie Parish Church, which she has attended for more than 60 years, she also drives to the local shops. "I don't get nervous, I just take it as I find it. I take the quieter streets. You just have to watch what you are doing." Driving tests did not exist when she first got behind the wheel back in the early 1930s. "It was too long ago for all that," she said. 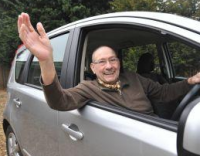 Stan McMillan is 82 and has covered many miles since passing his test in 1954. Stan holds the RoSPA Gold Award - the highest achievement level in their advance driving test. "One of the things you can never buy or teach is experience. I passed my test in 1954 and I have never had an accident. If people are fit and well, why shouldn't they be allowed to drive for as long as they want to? "I take a test with RoSPA every year and I think driving is one of those things you can never stop learning." The drivers above are great examples to show that driving when getting older can be safe - in 2010 we had a gentleman on one of our driving instructor improvement courses who had become a driving instructor by gaining his qualification a year earlier at the age of 75 - and he had a healthy business! Analysis of data on vehicle accidents showed that drivers aged 70 are involved in 3-4 times fewer accidents than 17-21 year old men. By observing older drivers, the study found that most mistakes made occurred on right turns and overtaking. Young men are more likely to be involved in incidents resulting from driving too fast and losing control. Although there appear to be some notable exceptions in all fields, elderly marathon runners, scientists, artists, musicians, etc., it's an undeniable fact that as we get older our ability to function begins to deteriorate. 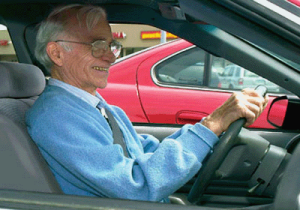 This deterioration is both physical and mental, but as long as the deterioration is not serious, many older people will continue to drive safely; their safe driving can possibly be attributed to the fact that their skills have been consolidated into a learned and instinctive pattern of driving. 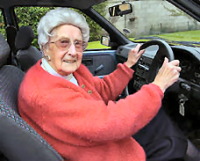 There is no maximum age limit to driving, but all motorists, whatever their age, must inform the DVLA about any conditions such as heart disease or epilepsy, or changes in their health or disability which may affect their ability to drive safely. This is why UK licence holders have to renew their licence on reaching seventy and then every three years - there ids no re-test, but medical certification of fitness to drive is required. While many older drivers will often readily accept physical limitations and take steps to overcome any problems that they become aware of, deterioration in cognitive functioning can be harder to accept or deal with. Accidents involving elderly drivers often occur at junctions, particularly when turning right – this suggests that, at least in this context, judgement and decision making skills suffer with age. In order to drive safely, we need to integrate physical, visual and cognitive functions. Some older drivers feel that because they have a lifetime's experience they are, by default, highly skilled. Just because you've never had an accident, it doesn't necessarily follow that you never will! It's estimated that as much as ninety percent of the information needed for safe driving comes from vision. Eyesight is often the first sense that deteriorates with age. In addition to reduced visual acuity (especially night vision) age can affect peripheral vision, depth perception and the speed at which our eyes adjust to changes in light levels. Some estimates suggest that a fifty-five year old can take up to eight times longer than a sixteen year old to recover from glare. Some older drivers can take twice as long as younger drivers to recognise the flash of brake lights because of an impaired ability to determine colour. 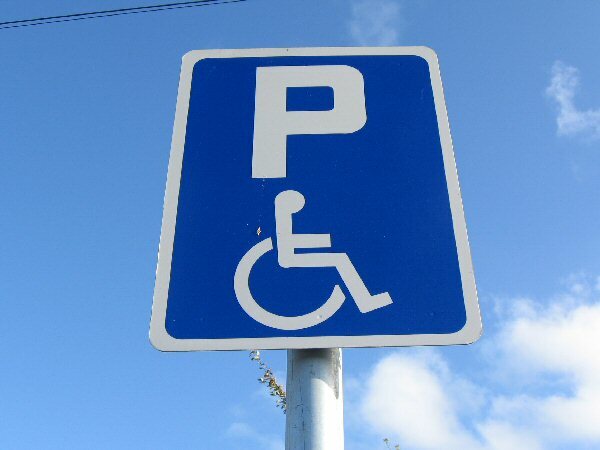 Restricted mobility and muscular stiffness can make it difficult to observe the road at some junctions or when manoeuvring. Weakening muscles can affect ability to steer and brake. Getting in and out of the car becomes more difficult, thus creating more time exposed to danger when parking at the roadside. A slower response time can cause problems if other drivers stop suddenly, or pull out in front. Even slight deafness can make it difficult to pinpoint the direction of sound, for example, emergency vehicle sirens. Ability to hear the engine may be affected and the fact that it will be harder to hear passengers during conversation means that the driver could be prone to distraction. As our cognitive functions slow down it becomes more difficult to 'multi-task'. As youngsters we may easily be able to simultaneously negotiate a junction, hold a conversation, listen to music and look for road signs, the same task can seem like a complex juggling act when we get older. While many of us might live to be healthy octogenarians, others will suffer from age related diseases such as Parkinson's, arthritis, diabetes, insomnia, depression or any number of common health problems. Added to the other effects of age, these can pose a serious problem for drivers. Prescribed drugs might also affect ability to drive. As we get older our tolerance for alcohol declines and the effects of alcohol last longer. This means that even a single drink can become a problem for older drivers. The tendency to overestimate driving ability probably spans all ages, however, older drivers are less likely to 'get away' with mistakes. So what can older drivers do to compensate for the problems that are inevitable for most of us? And how can driving instructors help older drivers? While courses exist in the UK for older drivers, the retraining and assessment of elderly motorists is not part of our mainstream culture. If you are an older driver some of the ideas below might help, if you are a driving instructor you can use the information as a starting point for your new 'Safer Driving Over Sixty-Five' courses. All drivers should have regular eye checks. This becomes more important as we get older. Drivers over sixty years of age will gain peace-of-mind from an annual visit to the optician to check for cataracts, glaucoma, macular degeneration, diabetic retinopathy and other conditions associated with aging. 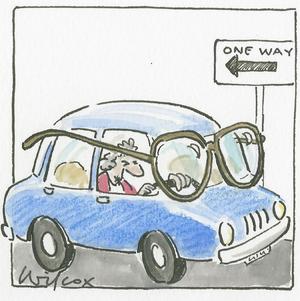 By simply making sure that you always wear your glasses (if you need them for driving) you can do much to improve your safety. Follow the night driving rules of making sure your windows and lights are clean. Use clear glass spectacles at night, tinted glass may reduce the glare, but it will also dangerously reduce what you can see. If approaching headlights dazzle you, momentarily look down and to the left of the road. Changes in light and long shadows can make driving at dawn and dusk particularly difficult, avoid these times whenever possible. Fitness to drive is no different from fitness for many other activities. Seek out a senior fitness programme that can help tone your muscles with light exercise (subject to your doctor's approval). By choosing a car with automatic transmission, power steering and power-assisted brakes, the driving task becomes easier. There are special aids available to help with all aspects of driving, however, if you shift from manual to automatic transmission, or make other changes, seek help from a specialist, qualified driving instructor. Get used to watching for the flashing lights of emergency vehicles if you have difficulty hearing the sirens; getting into the habit of making lots of mirror checks will help with this. Use a passenger as a second pair of eyes at junctions, but never rely solely on their judgement. This a way to ensure you always have sufficient room to stop in an emergency. Watch the vehicle in front pass a fixed point and say out loud - "Only a fool breaks the three-second rule and I've got time to spare" - this takes about three or four seconds to say. If you pass the fixed point before you finish speaking, drop back, you are too close for comfort! While courses exist in the UK for older drivers, the retraining and assessment of elderly motorists is not part of our mainstream culture. Be aware that ultimately, for those who live long enough, no one is immune from the effects of ageing. This means that there might well come a time where you have to make the difficult decision to stop driving. Be aware of the advice of friends and family if they raise concerns about your driving, they are the ones who love you the most and care about your well being. Giving up driving can be difficult and traumatic, but when the time comes you must make the decision for your safety, and for the younger people and children who share the roads. 'Edgar Barnes feels like a kid again, but at 81, he's not happy about it. Mr. Barnes gave up driving two years ago because he had blackouts. His daughter and son-in-law convinced him to stop driving and move into their Blue Ash home. "I used to say, "Mother, may I borrow the car?' Those days were gone and forgotten," Mr. Barnes says. "Now, they're back again. I've gone full circle. Now, I've got to put a reservation in to go somewhere. I don't blame my daughter and son (in-law). If I would be driving and something happened, I'd feel terrible." Maybe we need to show a little more tolerance towards the 'doddery old fool' in front – after all it's only a matter of time until you take on that role yourself... That's if you are lucky enough to live long enough. Perhaps the best advice that we can offer older drivers is to simply be aware. Be aware of the limitations that age can bring.